Hieronymus Bosch (c 1450–1516), The Temptation of Saint Anthony (fragment) (detail) (c 1500–10), oil on oak panel, 38.6 × 25.1 cm, The Nelson-Atkins Museum of Art, Kansas City, MO. Photo Rik Klein Gotink and image processing Robert G. Erdmann for the Bosch Research and Conservation Project, via Wikimedia Commons. Hieronymus Bosch’s works are among the most visually intense paintings, packed with hordes of his distinctive visual inventions. They may at first seem overwhelming, but as you get to know his paintings better, patterns and order start to emerge. One of his most visually consistent elements is, of course, his signature owl. There are many other characters and creatures which appear variously in several paintings: the man riding with a sword impaling him, creatures with spoon bills, and more. This, the last of my scheduled articles in honour of the five-hundredth anniversary of Bosch’s death, looks at one of his more curious and opaque visual devices, the inverted funnel worn as headgear, something which I have not seen analysed elsewhere. Coming from an artistic family, Bosch must have had access to an extensive library of images, and many of his works show influence from contemporary prints. I suspect that he was well aware, possibly even from first-hand experience, of the traditional hats worn by Jews at the time. Their origin goes back to the Jewish diaspora of the Middle Ages, when Ashkenazi Jews (in particular) migrated to northern Europe, from about 800 CE. Predominantly Christian powers sought to make visible signs to distinguish Jews (and, to a lesser extent, Muslims) from local Christians, and for many centuries the migrants were persecuted, confined to Jewish ghettos, and generally kept in isolation as much as possible. One common discriminatory technique employed in much of northern Europe was to require Jews to wear distictive hats. This played on religious requirements for Jews to cover their heads, and the fact that most people wore hats when they were outdoors. The patterns of Jewish hat most often recorded are pointed or conical, and some have highly distinctive ‘bobbles’ at the top. Unknown, Inuentio sanctae Crucis, Illumination from the Passionary of Weissenau (Weißenauer Passionale) (1170-1200), Codex Bodmer 127, fol. 53v, Fondation Bodmer, Coligny, Switzerland. Wikimedia Commons. 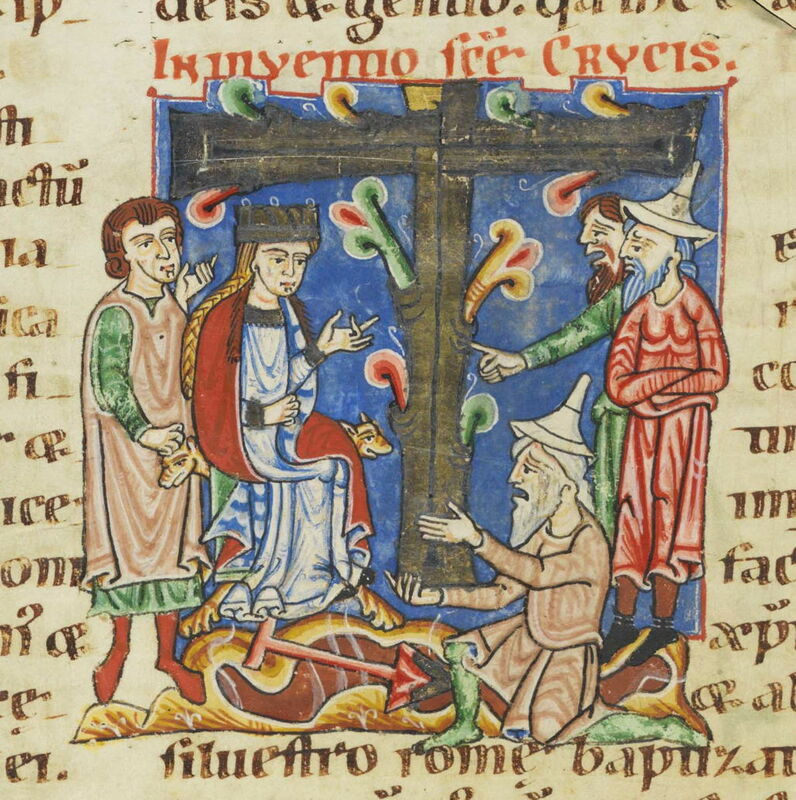 Although it is often stated that these Jewish hats appeared after 1215, graphical records of them start in the 1100s, here in a miniature from the Codex Bodmer from 1170-1200. 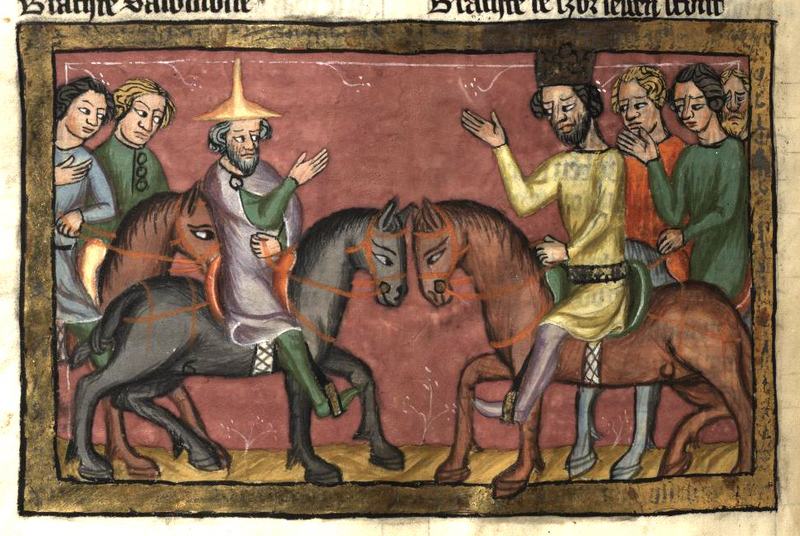 Rudolf von Ems, Die Königin von Saba und Salomo begrüßen einander (statt der Königin ist hier allerdings ein bärtiger Jude dargestellt) (1350-1375), Miniatur 189, fol. 316v, Weltchronik, Böhmen (Prag), Hochschul- und Landesbibliothek Fulda, Aa 88. Wikimedia Commons. By the 1300s these were well-known, and some miniatures showing them, here a painting by Rudolf von Ems in the Weltchronik of 1350-1375, show how similar they had become to inverted funnels (which were in general use by this time). Master of the Třeboň Altarpiece, Bearing of the Cross (c 1390), tempera and gold on panel, 123 × 93 cm, Muzeum Narodowe w Warszawie, Warsaw, Poland. Wikimedia Commons. 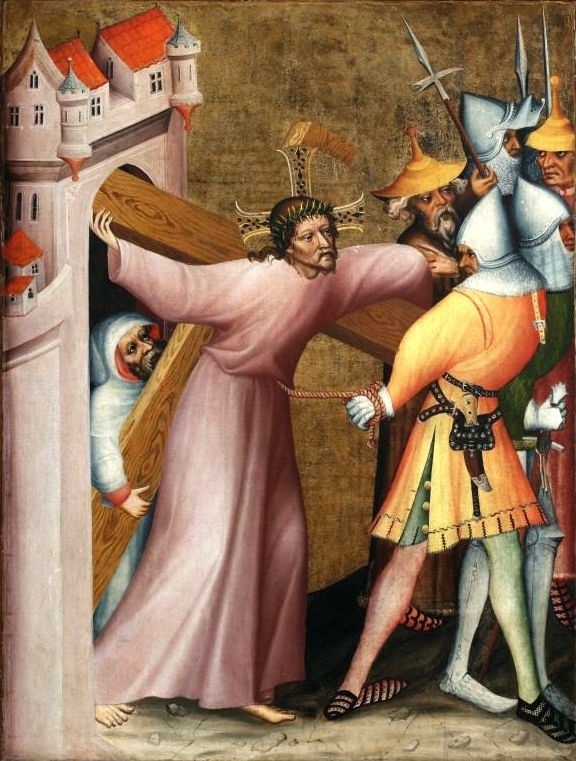 The Master of the Třeboň Altarpiece shows a couple of examples in the Bearing of the Cross (c 1390). 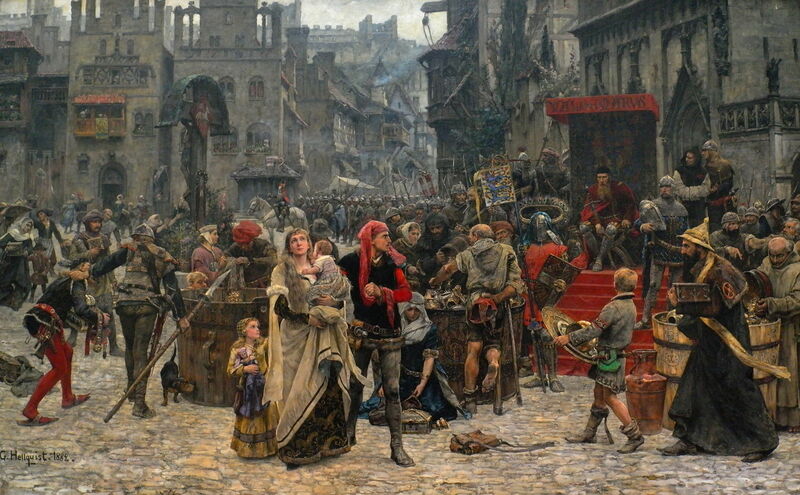 Carl Gustaf Hellqvist (1851–1890), Valdemar Atterdag holding Visby to ransom, 1361 (1882), oil on canvas, 200 × 330 cm, Nationalmuseum, Stockholm. Wikimedia Commons. 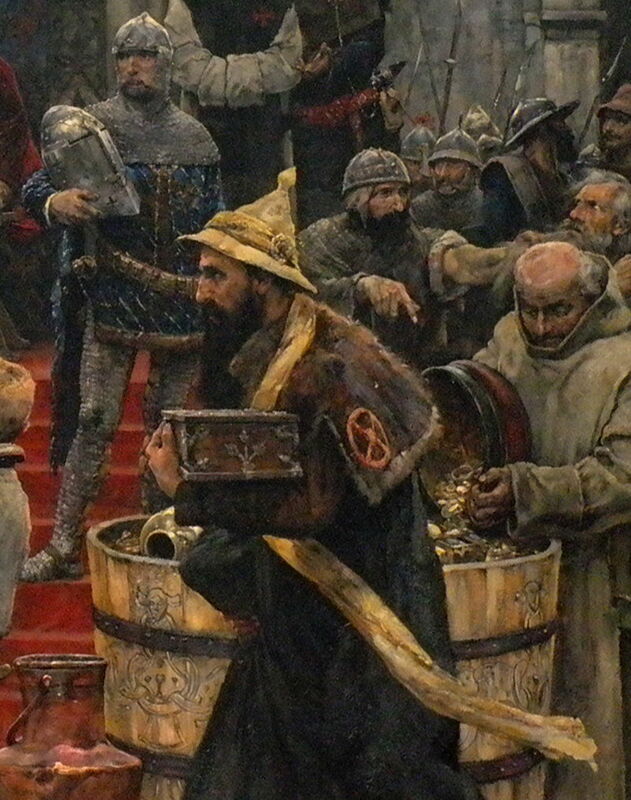 They are also to be seen in more recent historically-accurate depictions of the Middle Ages, as shown by Carl Gustaf Hellqvist in the right of his wonderful large history painting of Valdemar Atterdag holding Visby to ransom, 1361 (1882). Carl Gustaf Hellqvist (1851–1890), Valdemar Atterdag holding Visby to ransom, 1361 (detail) (1882), oil on canvas, 200 × 330 cm, Nationalmuseum, Stockholm. Wikimedia Commons. Some of Hieronymus Bosch’s earlier paintings show variations on this theme, including an unusual armoured version seen in the crowd in his Ecce Homo. It was not until his Last Judgment (Bruges, c 1495-1505), though, that Bosch makes the visual transformation from the Jewish hat to an inverted funnel, as seen in the right wing of that triptych. This peaks in his Temptation of Saint Anthony (Lisbon, c 1500-10): here the crossbill bearing a letter, in the foreground of the left wing, is wearing a funnel on its head. In the centre panel, a rotund creature at the foot of the decorated pillar is wearing another. The same theme appears in the Nelson-Atkins fragment of The Temptation of Saint Anthony (c 1500–10), where the funnel has now consumed the entire body, leaving just the arms and legs sticking out. Hieronymus Bosch (c 1450–1516), Gluttony and Lust (fragment of left wing of The Wayfarer triptych) (detail) (1500-10), oil on oak panel, 34.9 x 30.6 cm, Yale University Art Gallery, New Haven, CT. Wikimedia Commons. One of the gluttons shown in the Gluttony and Lust fragment of the left wing of The Wayfarer triptych (1500-10) is both rotund and wearing an inverted funnel on his head. This particular visual invention had faded away by the time of Bosch’s The Haywain Triptych (c 1510-16), although its central panel still contains some headgear probably derived from the appearance of the Jewish hat. The inverted funnel did not die with Bosch in 1516. Such was the popularity and influence of his paintings (and copies) of The Temptation of Saint Anthony that others propagated their visual elements. Cornelis Massijs (c 1510/1511–1556/1557), The Temptation of Saint Anthony (detail) (c 1540), oil on canvas, Koninklijke Musea voor Schone Kunsten van België, Brussels. Wikimedia Commons. Cornelis Massijs tucked a tiny creature away in his version of about 1540, but there is no doubt that it is wearing a shiny inverted funnel. Maerten de Vos (1532–1603), The Temptation of Saint Anthony (detail) (1591-4), oil on panel, 280 x 212 cm, Koninklijk Museum voor Schone Kunsten, Antwerp, Belgium. Wikimedia Commons. Maerten de Vos seems to have been the first to develop Bosch’s inverted funnel to hold a lit candle in its spout, in 1591-4. David Teniers the Younger painted at least three different versions, each using de Vos’s variant, around 1650-60, over a century after Bosch’s death. David Teniers the Younger (1610–1690), The Temptation of Saint Anthony (detail) (c 1660), media and dimensions not known, Palais des Beaux-Arts, Lille, France. Wikimedia Commons. David Teniers the Younger (1610–1690), The Temptation of Saint Anthony (detail) (c 1650), oil on copper, 55 × 69 cm, Museo Nacional del Prado, Madrid. Wikimedia Commons. David Teniers the Younger (1610-1690), The Temptation of Saint Anthony (detail) (c 1650), oil on canvas, 80 x 110 cm, National Museum of Western Art, Tokyo. Wikimedia Commons. At about the same time, Joos van Craesbeeck brought together several themes from Bosch’s images in his Temptation of Saint Anthony: the inverted funnel hat, a rider facing the wrong way (although not impaled by a sword), playing the lute, a duck, and a unicorn. Joos van Craesbeeck (c 1605–1654/1661), The Temptation of Saint Anthony (detail) (c 1650), oil on canvas, 78 x 116 cm, Staatliche Kunsthalle, Karlsruhe, Germany. Wikimedia Commons. Although wearing an inverted funnel as a hat seems to have died out in later paintings, this visual device has evolved further, developing from the fear of Jews which so often bubbled up in European society. The funnel reverted to a cone, and became the standard tall conical hat which is characteristic of magicians, wizards, and those who meddle with the occult. So next time that you encounter a wizard’s hat, remember Bosch’s funnels, and their role in shaping our visual imagery. Posted in General, Painting and tagged Bosch, funnel, hats, Jewish, magician, painting, wizard. Bookmark the permalink. Awesome post – this explains a lot, thanks. I believe that, according to the current catalogue raisonné, that is not thought to have been painted by Bosch’s hand. Each of the figures, including the one with the funnel stuck up its bum, appears elsewhere in more securely-attributed works, and in the work featuring that funnel, blackbirds are also flying out of it. It’s another example of Bosch’s remarkable inventiveness, and a piece of ribald humour. Such funnels are shown elsewhere as being used for the administration of enemas, as they were until relatively recent times. Thanks for spotting that – it’s a particularly clear image, even if not accepted as being by Bosch himself. Thank you for this. 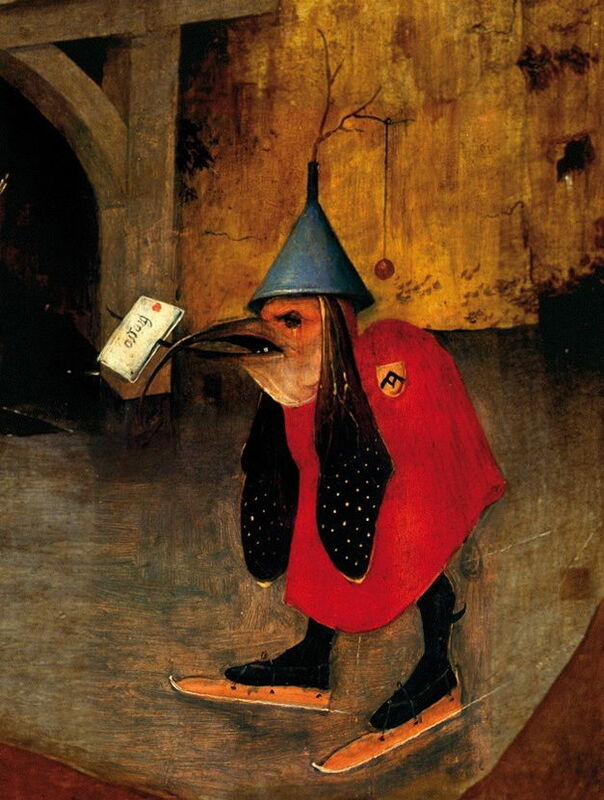 I have been wearing a funnel as a hat for years as part of costumes I wear at parties, knowing it from Bosch’ paintings and thinking it symbolizes madness. I am not to happy to hear it had descended from discriminatory measures against Jews, but hopefully people don’t interpret it in this way. But what does an inverted funnel worn as a head symbolize? 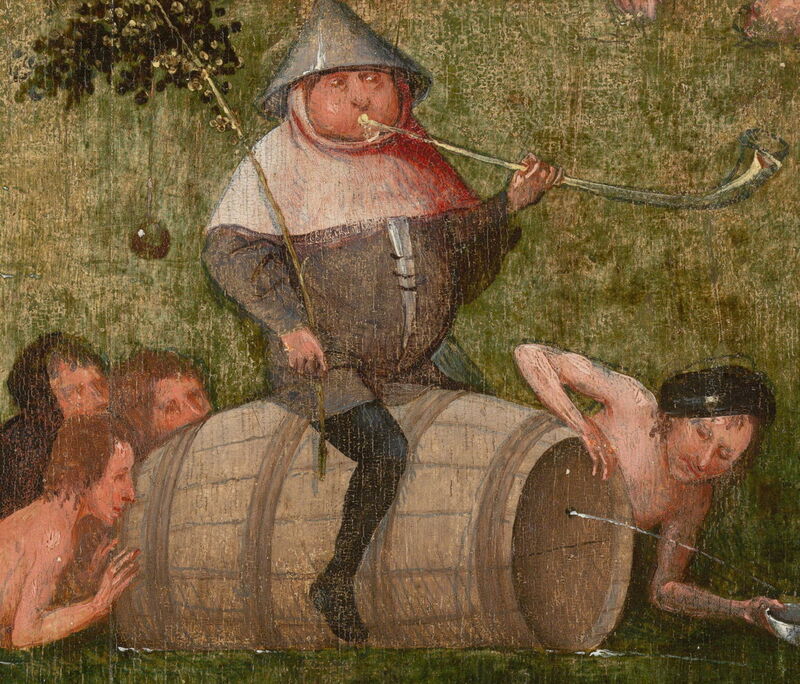 In Bosch’ paintings, the funnel seems to indicate some sort of foolishness or evilness. The surgeon performing brain surgery in Cutting the Stone is a charlatan. The overindulging glutton is a sinner and seems mad as well. The crossbill wearing a funnel has a crazy appearance and I wonder what the role of the letter he is holding has in the Temptation. What do you think? What does the funnel symbolize? 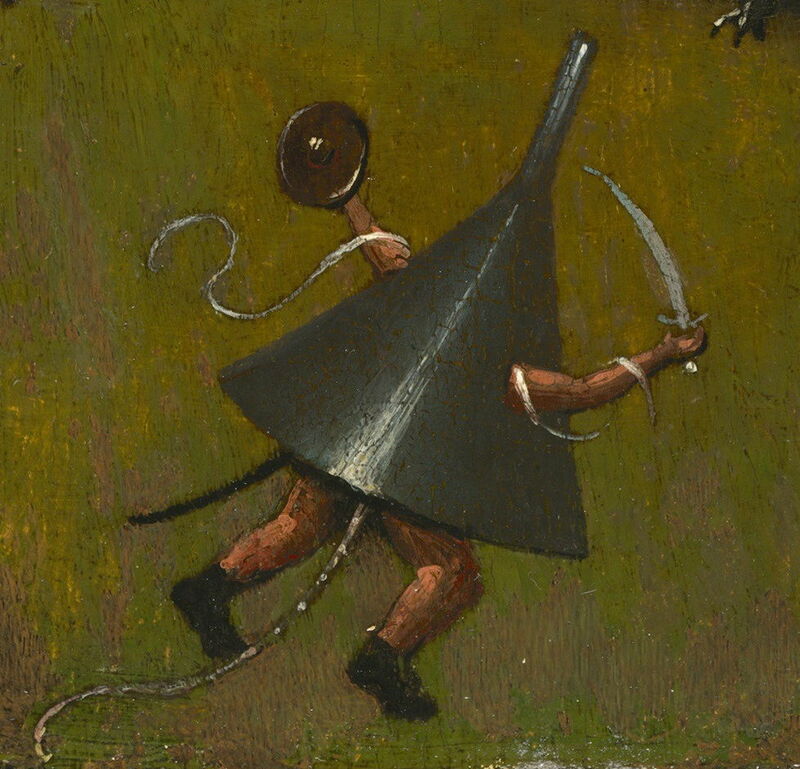 I’m not sure what Bosch considered the funnel hat meant. It could have crossed over a bit from the dunce’s cap, which is claimed to have been used from the writing of Duns Scotus in the 1200s: he believed its conical shape improved brain function. Or so the story goes.